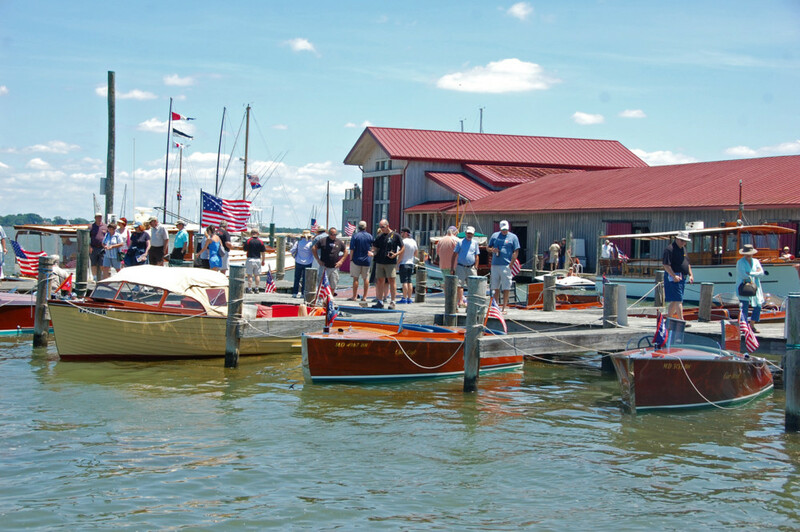 This Father’s Day weekend, the 26th Annual Antique & Classic Boat Festival comes to the Chesapeake Bay Maritime Museum (CBMM) in St. Michaels, MD, bringing more than 130 boats to CBMM’s docks and campus. Boat rides aboard the buyboat Mister Jim will be available, along with a selection of regional foods, beer, and other beverages. Noted restoration expert and Complete Wooden Runabout Restoration Guide author Don Danenberg highlights Saturday’s list of guest speakers, while 70 juried artists and craftspeople offer maritime and nautical items as part of the The Arts at Navy Point throughout the three-day event. For more information, visit www.cbmm.org or call 410-745-2916. Wooden classics and other antique boats come to the Chesapeake Bay Maritime Museum (CBMM) this June 14 – 16 for the 26th Annual Antique & Classic Boat Festival in St. Michaels, MD. Hosted by the Chesapeake Bay Chapter of the Antique & Classic Boat Society (ACBS), this Father’s Day weekend event brings an era of by-gone days to CBMM’s waterfront campus. The festival is highlighted by the largest collection of antique and classic boats on the East Coast, along with The Arts at Navy Point, where 70 juried fine artists, craftspeople, and vendors offer nautical and maritime-themed items for boat and home. Owners of some of the most beautifully restored yachts and cabin cruisers will offer boarding along CBMM’s docks, with Friday noted as the best day for tours. CBMM’s buyboat Mister Jim will offer scenic cruises along the Miles River throughout the three-day festival. More than 130 wooden, fiberglass, and metal boats will be on land and in the water for this ACBS-judged boat show, including a selection of Chris Craft, Larson, Gar Wood, Century, Donzi, Shepherd, Trumpy, Lyman, and more. Boats range from runabouts to yachts, including race boats, work boats, launches, hydroplanes, and utilities. Workshops and seminars, building demonstrations, family activities, and a nautical flea market will be available throughout the weekend, along with a selection of regional and grilled foods, music, and a Pyrat rum bar for libations and other drinks. On Saturday, June 15, the ACBS Chesapeake Bay Chapter brings noted restoration expert and Complete Wooden Runabout Restoration Guide author Don Danenberg to the Steamboat Building as one of the day’s speakers. Danenberg will share his insights on proper yet efficient techniques for restoring classic boats, working with a restorer, and more. Seating is limited and available on a walk-in basis. Children’s activities include boatbuilding craft projects, and the Hagerty Insurance Marine Youth Judging program, where youth learn about the award-winning qualities of preserved and restored classic boats. Along the Fogg’s Landing side of CBMM’s campus, the festival’s Field of Dreams features an array of restorable classic boats and motors, along with other items in a nautical flea market sale. Festival admission also includes entrance to CBMM’s new special exhibits, Crisfield Carvings—Bird Hunting on Broad Waters in the Waterfowling Building, and Navigating Freedom: The War of 1812 on the Chesapeake Bay in the Steamboat Building. During the festival, visitors will have full access to CBMM’s 12 exhibit buildings, including the 1879 Hooper Strait Lighthouse. Festival hours are Friday, June 14, from 11am to 5pm; Saturday, June 15, from 10am to 5pm; and Father’s Day, Sunday, June 16, from 10am to 2pm. The festival includes admission to the museum’s twelve exhibit buildings, where authentic, Chesapeake boats and traditions are highlighted. The event is free for CBMM members and children under six, or $13 for adults; $10 for seniors; and $6 for children 6-17. Boat rides and food are additional. For more information, call 410-745-2916 or visit www.cbmm.org.